Many of us make New Year’s resolutions that, at least for me, do not always get honored. However, this coming year I want to make some resolutions that will honor God, further His Kingdom, and help spread the Gospel of Jesus Christ. These are just my resolutions; I am not saying that everyone should adopt them too…but then again. Too many times, when I am struggling, my last resort is to pray. It should be my first resort, but I often try to fix things myself without bothering God. Then, when I realize that things are not getting better, and are sometimes getting worse, it dawns on me that I should have taken my problem to God first. In the New Testament, Paul tells us, “…do not be anxious about anything, but in everything by prayer and supplication with thanksgiving let your requests be made known to God. And the peace of God, which surpasses all understanding, will guard your hearts and your minds in Christ Jesus” (Philippians 4:6-7 ESV). Who couldn’t use a little more peace? I think Matthew 6:25-34 comes into effect here, summarized in this verse, “But seek first the kingdom of God and his righteousness, and all these things will be added to you” (ESV). This past year has had its ups and downs which I have handled in a variety of different ways; some Godly, some not so Godly. However, every time that I purposefully turned the situation over to God, He took care of the situation in a way that far exceeded anything I would have ever thought of…every single time. I want to get my priorities so in tune with God’s will, that my every endeavor is in line with what He wants for me. The Bible has one Author; it has many writers, but one Author. From the first page to the last, it speaks to our hearts. “For the word of God is living and active, sharper than any two-edged sword, piercing to the division of soul and of spirit, of joints and of marrow, and discerning the thoughts and intentions of the heart” (Hebrews 4:12 ESV). The Bible is the story of everything; it begins with Creation and ends with Eternity. I remember how blessed I felt when I read through the Bible for the first time. Granted, there are some difficult parts to get through, and there were many times when I did not fully understand what I was reading. However, by reading it from the front to the back, I saw how it all fit together…and it made much more sense to me. It helped me know God better, and that in itself makes the sometimes difficult work of reading through it, worth every second. John 6:68 tells us that the words of Jesus are the words of eternal life. There is no other book as important as the Bible. No book of philosophy, science, mathematics, medicine, or any other human discipline is as foundational to everything as the Bible. The importance of studying this Word cannot be overstated. The Bible says that, “All Scripture is breathed out by God and profitable for teaching, for reproof, for correction, and for training in righteousness…” (2 Timothy 3:16 ESV). If we want to know God, and please Him, we must study His Word. Too many times, the hustle and bustle of life leaves us with precious little time to spend with our loved ones. We get so wrapped up in our jobs, careers, hobbies, even church, that our family time suffers. However, our families are gifts from God; and we must not neglect these wonderful gifts. Our families, especially our spouses, are our emotional support. I have experienced the difficulty of functioning in the world when things were not right at home. It is the feeling of having no foundation, the feeling of being adrift without an anchor. God instituted the family at Creation (Adam and Eve); this shows that He attaches great importance to it; so should we. Every day, more and more I realize how blessed I am to have a job. Therefore, I should strive to live out my faith at the workplace in order to honor God. I am a witness for Him wherever I go, and I spend a great amount of time at work. Those who know that I am a follower of Jesus are watching me. Some hope that I will remain true to my faith; others believe that it is only a matter of time before I fall. Nevertheless, eyes are watching me and I want to represent my Savior the best I can. Philippians 2:15 tells us that we should be, “blameless and innocent, children of God without blemish in the midst of a crooked and twisted generation, among whom you shine as lights in the world” (ESV). As I get older, I realize that this body of mine is not as resilient as it once was. It also retains more of what I eat than it used to. If I do not take care of myself, and I am unable to do what God wants me to do, I dishonor Him. Therefore, I should be diligent to take good care of myself physically. I just wish that I had started many years ago. (And that I didn’t like Oreos as much as I do). I love apologetics, I love presenting the case for Christianity to those who need to hear it. However, I need to be more mindful that the goal of apologetics is not simply to win an argument, but to introduce people to the God and Savior of the world. I want to make the end of every apologetic discourse in which I am involved to be a presentation of the Gospel message of salvation through faith in Jesus Christ. I pray that God will guide my thoughts and motivations so that everything I say and do in the course of any apologetic discussion will draw people to Him. “…but in your hearts honor Christ the Lord as holy, always being prepared to make a defense to anyone who asks you for a reason for the hope that is in you; yet do it with gentleness and respect” (1 Peter 3:15 ESV). In December/January, many people all over the world will make New Year’s resolutions. 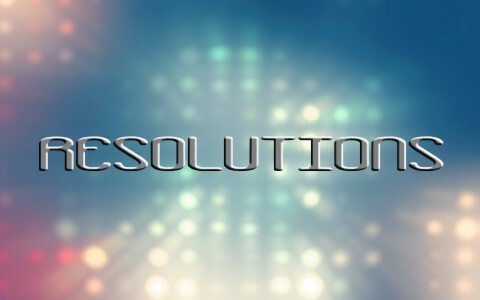 Many will be good resolutions such as to stop smoking, be nicer to people, or lose weight. However, there is one resolution which stands above all others, and that is to resolve to put one’s trust in the saving work of Jesus Christ. To do so results in the most wonderful change imaginable to one’s life, both now, and for eternity. For those of us who know Jesus as our Savior, I would encourage each of us to take stock of our Christian walk to see if we are ‘walking worthy’ of our Lord (Ephesians 4:1; Colossians 1:10; 1 Thessalonians 2:12). If we are not, maybe it is time for some ‘Christian New Year’s Resolutions’. Different types of love, What is backsliding?, What sets Christianity apart from other religions? What a treat to hear from you Robert! Happy New Year! I want to walk “appropriately” also, as one called of God. How does that walk look? If we think about it for just a moment it is not a walk where I will ever “do” anything(walk) to be or to make myself worthy. I know this is old news as Derek and I have gone over this many times before. I do think it is important though because the translators got it wrong. The word translates “appropriately”, which has a meaning a world apart from “worthy”. What do you think? I enjoyed your article and hearing from you! This article is actually a reprint of an article I wrote a year or two ago. However, that being said, I have now had time to have put these resolutions into action and can report that they have had a tremendous effect on my faith. By faithfully practicing these disciplines, my relationship with Jesus has improved dramatically. I also agree with your assessment of ‘walking appropriately’ or ‘worthy’. I think we walk in such a manner as reveals our relationship with Jesus. We walk ‘appropriately’ or ‘worthy’ because we have been made worthy due to our repentance and faith in Jesus Christ. It is He who makes us ‘worthy’, and our works are the result of our relationship with Him. May your 2016 be marked by a closer and more fruitful walk with Him. God bless you. Brother I read the your 7 Christian New Year’s Resolutions. Your resolutions for life very good your decisions for every one corrector of life. so God bless you. Thank you for reading and commenting. I can only hope that my efforts for His Kingdom will bear fruit in the lives of those with whom I come into contact (as well as bearing fruit in my own life). Previous post: Why Did God Keep Moses From Seeing The Promised Land? Next post: What Does The Bible Say About The Duties Of A Pastor?